In the recent years, Jeremy Renner has made it clear of his intentions to mark his territory in the world of action films. Like Tom Cruise and Shia Labeouf before him, he excels in his craft. Is he a type cast or simply sticking with what he knows best? That question is hard to answer in the Jason Bourne series’ latest film The Bourne Legacy. I do include this in the rest of the series, even though it is more of a spinoff series for a few reasons. First of all…it follows Ultimatum rather well. Like the films that preceded this, the film was based off of a Robert Ludlum book of the same name. However, after Bourne Ultimatum, Ludlum unfortunately passed away in 2001, leaving the series to Eric Van Lustbader. Not only that, but you have to remember the books following the original trilogy are marked as “new Jason Bourne novels”. 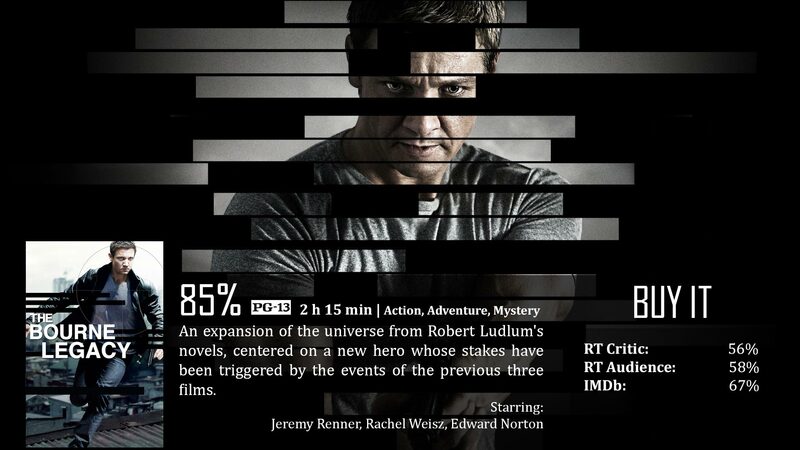 The main character is Jason Bourne, unlike the film version starring Renner as Aaron Cross. Already, there is a monumental shift in plot. For the most part, that’s the key ingredient that you have to consider before watching this film. The film revolves around Cross fighting for his life, as he needs the supplement of chems, or program medication to continue to live. However, the meds were discontinued several weeks prior. Program meds were given to several agents contracted into Operation Outcome, which seems to be another arm of the Treadstone program that began it all. It focuses on Cross because only he is smart enough to think for himself as Bourne once did. The plot thickens when the corporation’s secrets are threatened. The corporation decides to shut the program down, killing those who had the possibility to spill information to unwanted ears. All the while, Renner’s character enlists the help of Dr. Marta Shearing (Rachel Weisz) to help him live. Originally, this fact really confused the heck out of me, but after watching the series back to back, I know the answer to my own question. So, if any of you are wondering the same thing, well listen up…Aaron Cross and Jason Bourne were not in the same program. The same corporate leaders created, so far, three programs – Treadstone, Blackbriar, and Operation Outcome. Bourne was a part of Treadstone, Blackbriar was created to track down Bourne once Treadstone was shut down, and Operation Outcome was the new program with Aaron Cross. This program used pills to control their agents, so they wouldn’t ever have a loose cannon again. I’m much happier I understand that now, and I hope that lightens a few details up for you as well. So one thing we all must keep in mind going to see the film is not to compare it to its book counterpart. Not even the original trilogy starring Matt Damon followed the plot of the books. No, it doesn’t follow Bourne, which is what the entire book series is known for. Again, a film is a separate entity entirely. That being said, the film is actually very well done. Now, don’t forget that even though the film doesn’t focus on or star Damon as Bourne, he still plays a part in the film. This film mostly takes place during the events of Ultimatum and beyond, which is pretty cool. My theory is that Aaron Cross will be working his way to ultimately find Bourne…if they continue the story that is. The story may not have the same oomph as the others. This was much more simple to understand, as if to make room for more high-action scenes. Regardless, it was portrayed very well, and that portrayal shouldn’t be ignored. If you were a fan of the action scenes in the other Bourne films, then look no further, because the action in this film is seriously insane. Some of the fighting and car chases in this film trump the original trilogy, and I say that with haste, because I love the original trilogy. Even Renner, who plays Cross, sometimes seems smarter than Bourne during select scenes and his acting was especially strong when he had to give off that drug addict persona. Some of the original cast returned for short cameos, but was primarily made up of new faces. This is to be expected, as those original cast members are still on the hunt for Jason Bourne. Our corporate leader searching for Cross is played by Edward Norton. Norton is known for great roles, but sometimes the glove just doesn’t fit quite right. Norton’s character came off as unbelievable. All things considered, that was worst thing about this film, and it wasn’t substantial. Renner does a fantastic job at portraying a Bourne-like-character, and the overall feel of the series is not diminished. I still consider this welcome in the Jason Bourne franchise. No, this guy isn’t Jason Bourne, but he might as well be. He’s smart, collected, strong, fast, and he knows where he’s going and how he can instruct someone else to stay alive. The action in this film is insane, and the story is something you can understand and thoroughly enjoy. As I said before, Edward Norton doesn’t fit his role. He is supposed to be this corporate leader capable of intimidating others and all this, but as great of an actor that he is, I just didn’t feel it. I would expect someone older with broader shoulders and a deep-set voice to take on that kind of a role. Beyond that, it’s the fact that this isn’t Jason Bourne…that’s going to disappoint people enough to not even want to see it, which is definitely a shame. Aaron Cross: Now, I’ve got a plan, and it’s just not that complicated. What I’m going to do is wait for the next person to show up to kill you. Maybe they can help me. Good review Dave. Though it ended quite abruptly, I still have to say that I look forward to seeing what they do with this franchise, if they do decide to move forward. Especially if Matt Damon gets involved, then it surely will be something awesome and must-see. Nice review. Although I like Norton as an actor I also thought he was miscast in this role. I was open minded to following a different agent but it’s not as good as the Jason Bourne movies. I admire your love for “Legacy,” but it just didn’t work for me. Nice action scenes, but hardly anything else measures up. Too many people compare this film to the original. The fact is…it’s not the original film, not supposed to be. As a film on it’s own, the thing is spec-tacular. Seriously. I’ve seen it 3 times now and it just keeps getting better. I’ve seen it twice and it didn’t measure up as a movie for me on its own merit. I don’t expect it to be as good as the original, but as part of the trilogy I see it as the weak link, by far. Guess we’ll have to agree to disagree on this one.